Hey rasmataz, I was told by a guy at AdvanceAuto today that they dont sell the fuel filter and that I would have to buy the fuel pump module and that is $214. I guess that new filters are in the fuel pump modules, is that right? Is there any other way of getting this done? If not I will have to get the module and about how long does it take to install the module? From my understanding and from what the guy told me, he pulled it up and it had unserviceable and that I had to buy the module. Also he was telling me that alot of cars are going to that now. Ok I just did some calling around. I was told by a guy at another AdvanceAuto that the pump just has a strainer and that again I would have to drop that tank and put it in.I called Napa and he looked it up and told me that it is just outside the tank and has quick disconnect hoses I believe he said. Ok just returned from Shell station shop. The worker lifted my car we searched and searched and could not find any type of filter outside of the tank. So does that mean the filter is INSIDE the tank and how would I go about getting a filter unless its the one that the guy at Napa showed me but it has some quick disconnect hoses and some type of mounting bracket. Is the strainer the guy from Advance told me considered the fuel filter? I dont know. I replaced mine on my 1996 Stratus 4 cyl 2.4 l, it was on top of the fuel tank I had to lower the tank, not all the way and then replace, check edmunds book first, make sure tank has little gas, good luck, Declan. Hey did it have quick disconnect hoses on yours? I'm thinking mine is different being that I have an 01.I'm going to try and get someone to lower my tank and see if it is there or actually in my tank and if so I will have to get the feul pump module. I believe it had but am not sure, anyway why do you need to change the filter, also get that edmunds book, I like the guys at advance but that book does not lie, sometimes I call a Chrysler dealer and ask to speak to a mechanic, tell them you are a mechanic also but are wondering if there is a short cut, good luck Declan. You have a fuel strainer at the end of the fuel pump assembly. Replacing the strainer requires dropping the fuel tank down, removing the fuel pump assembly, prior to getting to the strainer filter. It is not advisable to perform the work without a garage, in my opinion. The fuel filter mounts to the frame above the rear of the fuel tank. Here is a guide to show you what yoo are in for when doing the job. I have a 98 dodge stratus and need to know where the fuel filter is and if it is something my dad could fix? I can add that except for diesel engines, unless the fuel filter is rusted and leaking, you will never solve a running problem on a Chrysler product by replacing the fuel filter. They commonly last the life of the vehicle. Where is the fuel filter located on a 2000 Dodge Stratus? The fuel filter mounts to the frame above the rear of the fuel tank. 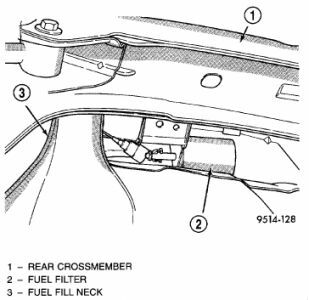 Fuel filter is located on the frame, above rear of fuel tank. Fuel tank must be lowered for access to fuel filter. 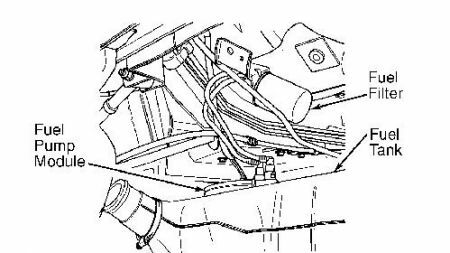 Fuel lines are permanently attached to fuel filter. Need removal and installation instructions? Just ask and you shall receive. Where is the fuel filter on this vehicle? I Needed To Know How To Change My Fuel Filter, And Also What All Parts And Tools I Will Need?